Mirror Doors Direct hand craft made to measure wardrobe mirror doors to fit your space. Wall to wall, floor to ceiling, exactly to your specification. We then deliver them direct to your door. You simply measure your space and order online with our simple ordering page. Customers can choose from sliding, pivot or bifold mirror doors and a selection of frame colours (white, black, silver, gold). Next our optional deluxe pack adds buffer strips to prevent slamming, and soft close to ensure the doors close softly to their end position. We provide full, easy to follow, step by step instructions on how to install your mirror sliding, pivot or bifold wardrobe doors. Mirror has wonderfully deceptive properties; a wall of mirrors presents the illusion of more space. It literally mirrors the room! Not limited to the bedroom, you can also repeat this look in dark hallways, living rooms, kitchens, studies or even the garage! A recent trend is the use of mirror doors in the home office, where all the clutter can be hidden away at the slide of a door. Furthermore; natural daylight and artifical lighting, reflect well in mirror. This gives a brighter and more spacious feel to the room. Especially relevant, you can argue that mirrors are money saving as they create the illusion of light. All our mirror is safety backed and manufactured to BS EN 1036-2 BS EN 12600 2 (B) 2 standards. The frames are manufactured from structural steel or aluminium with a weight loading up to 60kg. We provide a 5 year warranty with all working parts. 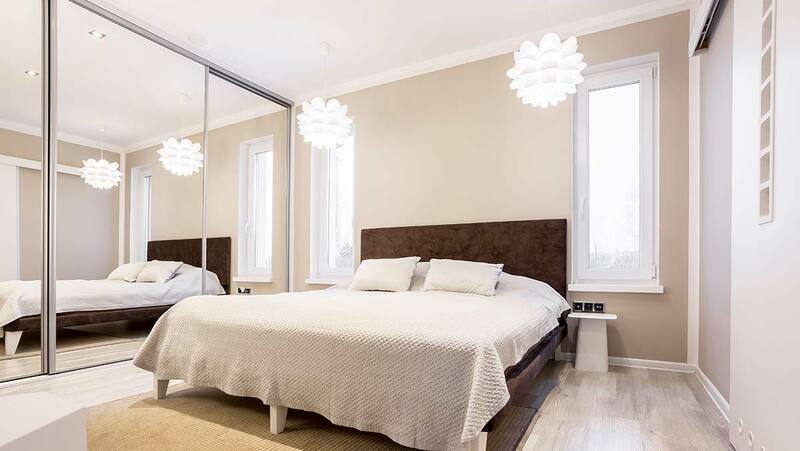 Finally, many of our customers are pleasantly surprised to find that mirror is the most cost effective material to make doors from, in comparison to MDF or glass. So if you want to create more space, more light and hide away your clutter at the best possible price, shop online with Mirror Doors Direct.